Elecmec works closely with its supplier base, seeking to promote quality at all stages of the supply chain. Our careful selection programme ensures that the majority of our suppliers are accredited to ISO 9001 and all are expected to demonstrate a commitment to continuous improvement - preferably by working towards ISO14001 and TS16949. To demonstrate our on-going commitment to providing a continuous, high quality service, Elecmec is certified to ISO 9001- 2008 and our partner in Asia has ISO 9001, TS16949 and EN14001. 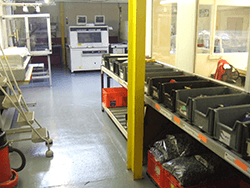 Full product life cycle management from prototyping, PPAP, manufacture, distribution and spares fulfilment are all managed within our facilities. Surface mount equipment including solder paste screen print, solder paste dispensing, adhesive dispensing, component placement and reflow soldering. Automatic wire processing equipment – cut, strip and termination. Ultrasonic welding and hot air staking of plastic products. End of line electronic test and continuity testing. We also have a variety of bespoke automatic and semi-automatic machines that are used throughout the business. Our structure and resources enable us to be highly flexible and responsive to the needs of our clients from prototypes to all levels of production from small to medium and high volume. We work with partners from the concept and specification stage through development, validation and production engineering to production. The ability to take products from concept through to full-scale production allows Elecmec to service a wide spectrum of applications.